An increasing number of academic research projects have been dedicated to wearable computing and smartphone apps. Samsung itself has made numerous forays into digital health in 2014, including key research partnerships and initiatives.With UC San Francisco, Samsung recently established the UCSF-Samsung Digital Health Innovation Lab where researchers and technologists can trial new mobile health technologies. 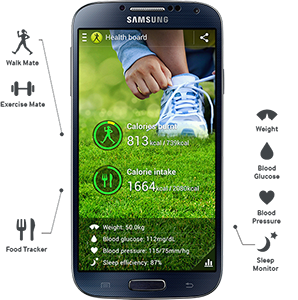 Samsung also released SDK’s for two new digital health platforms. On the hardware side, the company has developed Simband, an open reference design blueprint for building smartwatch-like wearable devices that incorporate advanced sensors to measure things such as galvanic skin response, ECG, heart rate, among others. SAMIIO — short for Samsung Architecture for Multimodal Interactions — is a cloud-based software data exchange platform. It aggregates data from a variety of sources (including Simband and other devices) for analysis. David Rhew, MD, is Chief Medical Officer and Vice President of Global Healthcare for Samsung SDS. Previously, Rhew was an infectious disease specialist at UCLA. He and his team hope to connect patients and their providers via the cloud, and go beyond healthcare portals to digitally connect everything that patients use: televisions, beds, homes, cars, and more. We spoke with Rhew about where digital health is headed, and what led him to his position at Samsung. What is Samsung doing in digital health? What we want to do is see if technology can assist individuals in their general medical care, to help them stay adherent to treatment regimens, and inform them about decisions made with healthcare providers. And that’s a very different area we know will require a lot of collaboration with healthcare providers and industry partners. We refer to that as our enterprise business. What’s the enterprise business about? Samsung’s usually known for their smartphones, televisions, and home appliances. Yes, while Samsung is very much known for consumer business, we’re now entering the enterprise area. We’re looking for key partnerships with provider organizations, providers, payers, and other groups to provide that level of guidance and support and also opportunities for collaboration and co-development. We think what people see in Samsung is their traditional consumer apps, and we’ll continue to make health and fitness apps. But the newer area that we’re starting to create [has a] need for a healthcare provider in these deployments [to] help support the patient [and] provide better care. Two different models. What does Samsung bring to the table, versus other electronics companies? I think, in general, organizations see Samsung providing value in that we provide consumer tech that patients use every day in the home and on the go. We can deploy sensors for people to wear and interact with, through daily tools, whether it be the phone, TV, or home appliances that may capture important information to help further guide and educate individuals. That’s something every organization is trying to understand: [take] consumer grade technology and put in use cases that are relevant for the healthcare provider. Many organizations can capture data during patient encounter visits, but as soon as [the patients] walk outside the hospital, they have no ability to understand or recognize what they’re doing, whether they’re adherent to treatment, whether there are questions, or whether they are progressing. Those are the things that organizations are trying to gain a better understanding of and develop tools for. So, at some point, patients can manage their own overall health. So what kinds of things is Samsung offering the enterprise — the hospitals and the healthcare providers? A lot of solutions we provide — [like] phones and TV’s — have direct implications on how healthcare providers communicate in the hospital, and the user experience that people have when they enter these facilities. We’ve created a series of devices that can improve those opportunities that healthcare providers can take advantage of, with newer functionalities and capabilities. We think that’s very important: workforce efficiency and patient experience has become quite an important experience in healthcare as well. Samsung is focused on that…to deploy that. We work with many companies to make this [a reality]. It’s not so much about “hey, just improve paging,” but “wouldn’t it be great if we improved our mechanism of communicating with doctors and nurses with phones and wearables.” A lot of people are recognizing there are unique opportunities, especially since Samsung has created a closed container security called KNOX. These are enterprise grade devices that can be used for a variety of purposes. That sounds pretty cool. How can physicians take advantage of these things, with Samsung? That’s a question we wanted to address at the mHealth Summit conference, and at the Samsung Developers’ Conference. Samsung has created an open software platform with API’s that developers — whether they be individual physicians or hospitals or companies — can write to and share data and be able to look within all the other data that’s shared, and find ways to better understand how to leverage those kinds of data. What is Samsung offering, then? I’ve heard of SAMIIO and SIMBAND. SAMIIO is an open software environment. SIMBAND is the open hardware reference design, which has a variety of sensors on a wearable, almost like a smartwatch, but allows people to innovate on the hardware side. We recognize that there’s a lot of innovation that needs to occur for this to make progress. Samsung is looking to make progress by opening the systems up, and enabling people to share, learn and ultimately create things. What’s the advantage of SAMIIO and SIMBAND, versus something like, say, Apple’s HealthKit? I can’t speak to what others are doing, but from our perspective, we think an open platform is a key decision. So, rather than requiring Samsung devices, we feel that a lot of the innovation will need to come from folks who use different devices. For instance, like a Fitbit, if certain individuals want to use Fitbit to capture their data, we think that’s fine, that data should be used in conjunction with other types of data with other devices like ECG monitors and other elements that would not be necessarily part of an individual company’s roadmap; we think there’s value to bring together disparate sources of data. We think an open platform would be advantageous. Others may go down a closed path, but from our perspective, an open platform is a great starting point. At the end of the day, we think of great consumer experiences, and if we can create that with our phones, TV’s, appliances, and enable that to occur through the use of our platforms, then our hope is that people will look at Samsung to provide an overall experience. We want open platforms, and a great user experience. There has been much talk about how the new crop of consumer-grade wearables aren’t fully realizing their potential as patients abandon them. What’s wrong with this picture? I think this all comes back to a generic perspective that technology can help consumers and patients with their care. But if that’s all you give to them, what ends up happening is that it’s really the folks that are most motivated that will want to take this tech and run with it. I feel like [tracking] activity and fitness in mHealth is just a starting point [for digital health]. In our next article, we will go more in depth with Dr. Rhew on how he got involved with Samsung, and his journey from his computer science roots to becoming an infectious disease physician, and now leading Samsung’s medical and health initiatives. Steven Chan (@StevenChanMD)is a resident physician in psychiatry & human behavior at the University of California, Davis School of Medicine, and is current American Psychiatric Association (APA) & Substance Abuse And Mental Health Services (SAMHSA) MFP Fellow. He’s currently researching asynchronous telepsychiatry & mobile healthcare applications. Steve previously worked as a visual designer and software engineer at both Microsoft & UC Berkeley.